Into a 16 oz. soup or coffee mug, place the following and stir well. Microwave for about 3 minutes, depending on the strength of your machine. Do NOT over cook. If you have saved some extra frosting from the large cake, you can top with that. OR top with ice cream, whipped cream, or BEST OF ALL, organic nonfat plain tangy yogurt. Recommended -- Trader Joe's European Style or Mountain High. HINT-- we use Toddy Coffee in our recipes. Either full strength for a super cafe taste, or diluted with 1/2 water. Toddy Coffee is very low in acids and oils and is a ''healthier'' alternative to regular coffee. 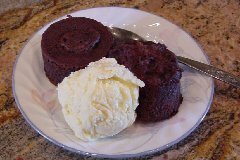 If you need to make a BIG Moist Chocolate Cake, HERE is the recipe, YUM! !